Bring your own snow machines by trailer or better yet, sled right to our door and make Happynest your overnight base for a multi-day trip. We'll have your fireplace already burning, and we can offer ultra-convenience special services such as shopping for your grocery-list and having it ready in your fridge when you arrive. 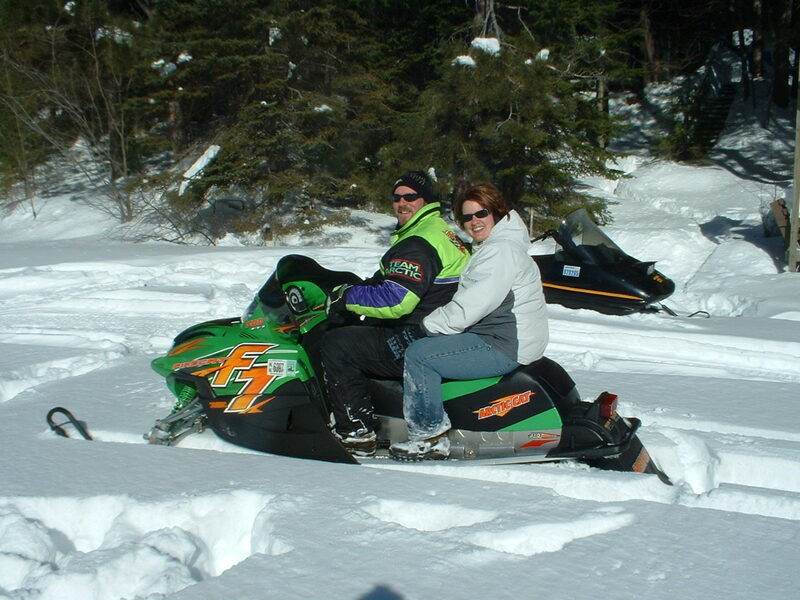 For guests without their own snowmobiles, we are happy to either make arrangements on your behalf or put you in contact with local snowmobile rental places and for a very reasonable fee they will have machines dropped off right to the Happynest driveway, with trail permit, all gassed up, and ready to take off! We are working on a high resolution map showing the combined trails of District 10 (Parry Sound), District 11 (North Bay), and District 12 (Sudbury), of the Ontario Federation of Snowmobile Clubs (OFSC). All three districts have trails into our area, but unfortunately, none of them definitively show each others' trails. In the meantime, the following is a snowmobile trailmap which is somewhat stylized and simplified to show four main loops of a "cloverleaf" that you can explore, centered on the Loring/Arnstein area which is just east of Happynest. Also it is somewhat out of date, as for example AR511 currently jogs north east to join C106, instead of crossing Wolsely Bay, and the Shuttle Service is no longer required since there are suspension bridges across the Pickerel and French Rivers now. Click on the map below to view it in a window on its own (1600x960 pixels, 0.36 Mb file size). Also, for high-speed internet users (or patient users), click this version which has a higher resolution (3100x1900 pixels, 1.1 Mb file size). Note, if you print it, we suggest you choose landscape orientation in your printer setup, to match the image's orientation to the paper's.